Tributes and remembrances of the life of Senator John McCain continued Monday, as the U.S. prepares for a week of commemorations in three cities. The 81-year-old McCain, who died Saturday after a lengthy battle with brain cancer, will first lie in state in the Capitol of his home state of Arizona in Phoenix on Wednesday. Two days later, he will lie in state in the U.S. Capitol Rotunda in Washington, where he made his legislative mark as an outspoken, maverick Republican senator for 32 years. 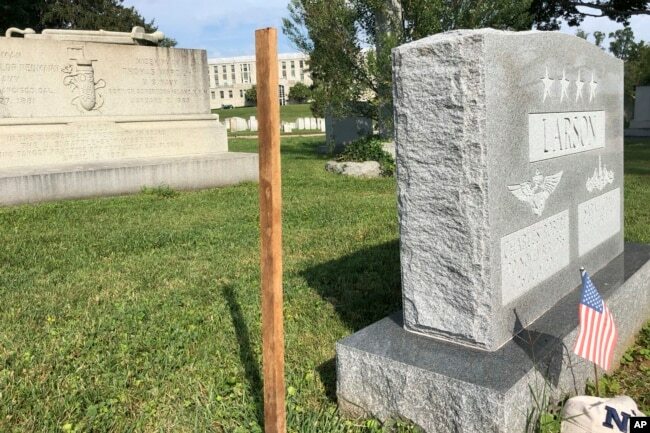 A wooden spike marks the spot, Aug. 25, 2018 where Sen. John McCain, R-Ariz., will be buried on the grounds of the U. S. Navel Academy in Annapolis, Md. World leaders and McCain's former colleagues in Congress, Republicans and Democrats alike, have shared their favorite memories of McCain, and extolled his status as a senior statesman on the world stage. They have remembered his military service as a naval aviator, especially his valor in enduring beatings and torture during 5 1/2 years as a prisoner of war at the hands of North Vietnamese captors at the height of the Vietnam War in the 1960s. But U.S. President Donald Trump, who frequently engaged in political taunts with McCain and three years ago said McCain was only deemed a hero because he was captured as a POW, was criticized after his initial reactions to McCain's death only expressed condolences to his family and didn't mention his military service or political career. The White House, according to a Washington Post report Monday, prepared a statement extolling McCain's life and calling him a hero, but Trump rejected issuing it. Flags at the White House were lowered to half-staff over the weekend in McCain's honor, but back at full-staff on Monday. Trump ignored reporters' repeated questions about McCain at White House gatherings on Monday, but late Monday afternoon the flags were lowered again to half-staff. 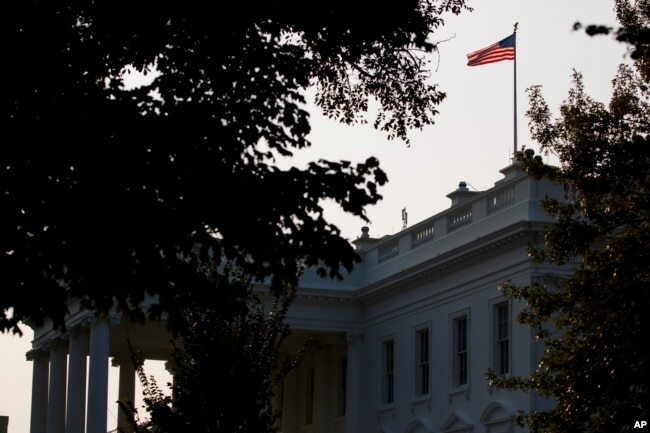 An American flag above the White House flies at full-staff less than 48 hours after the death of Sen. John McCain, Aug. 27, 2018, in Washington. At the same time, the White House released a statement from the president in which Trump said that, despite differences on policy and politics, he respects McCain's service to the U.S. and ordered flags be flown at half-staff until his internment. The statement also said Trump asked Vice President Mike Pence to offer an address at a ceremony honoring McCain on Friday, and that three cabinet members represent the Trump administration at services for McCain later this week. As he prepared for the end of his life, McCain said he did not want Trump at his funeral, instead favoring attendance by Pence, with whom he served in Congress. McCain, even as he neared death, disparaged Trump's presidency, rebuking the U.S. leader for his seeming embrace of Russian President Vladimir Putin's position at last month's Helsinki summit that Russia had not meddled in the 2016 U.S. presidential election. Trump, when he returned to Washington, altered his stance, but almost daily assails the investigation into the election interference. “The damage inflicted by President Trump's naivete, egotism, false equivalence, and sympathy for autocrats is difficult to calculate," McCain said at the time. "But it is clear that the summit in Helsinki was a tragic mistake." Previously, the White House posted tributes from numerous Trump officials praising McCain, who as the Republican nominee, lost the 2008 presidential election to Obama. The tributes singled out McCain's military service and heroism as a POW and his independence as a political leader. 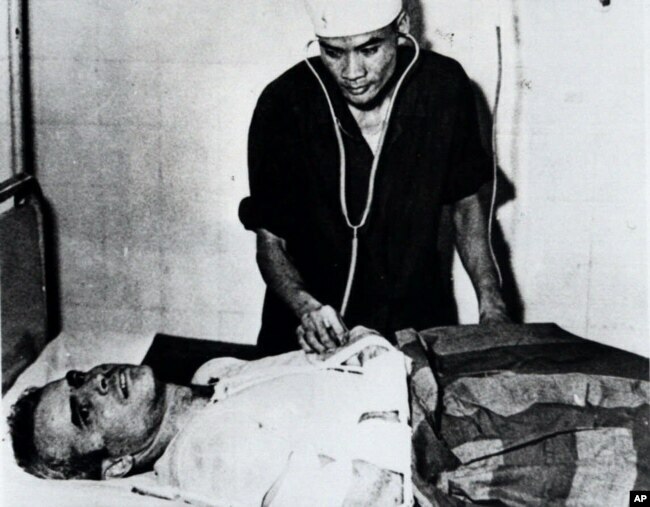 FILE - John McCain is administered to in a Hanoi, Vietnam hospital as a prisoner of war in the fall of 1967. All five living former U.S. presidents issued statements praising McCain. Outside the United States, world leaders lauded McCain's role and presence abroad. “John McCain was a true American hero," said French President Emmanuel Macron. "He devoted his entire life to his country. His voice will be missed. Our respectful thoughts go to his beloved ones." British Prime Minister Theresa May said McCain "embodied the idea of service over self." McCain for years has promoted closer ties between Vietnam, which imprisoned him, and the United States. 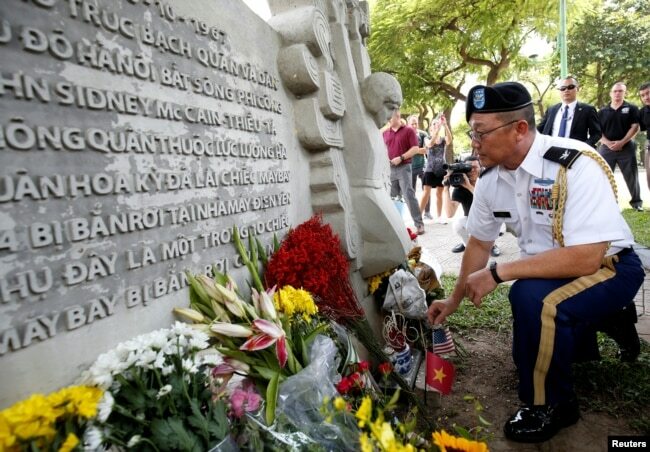 On Monday, Vietnam Foreign Minister Pham Binh Minh wrote in a condolence book at the U.S. Embassy in Hanoi, "It was he who took the lead in significantly healing the wounds of war, and normalizing and promoting the comprehensive Vietnam-U.S. partnership." Military Attache Ton Tuan from U.S. Embassy places incense while he pays respect in memory of the late U.S. Senator John McCain (R-AZ) at the McCain Memorial in Hanoi, Vietnam, Aug. 27, 2018. A monument to McCain on the shores of the Hanoi lake where was he was captured after his plane was shot down in 1967 has turned into a de facto shrine to him as news of his death reached Vietnam. Flowers, incense, flags and other tributes to McCain have been laid there.